I'll just come right out and say it - I love this pen. 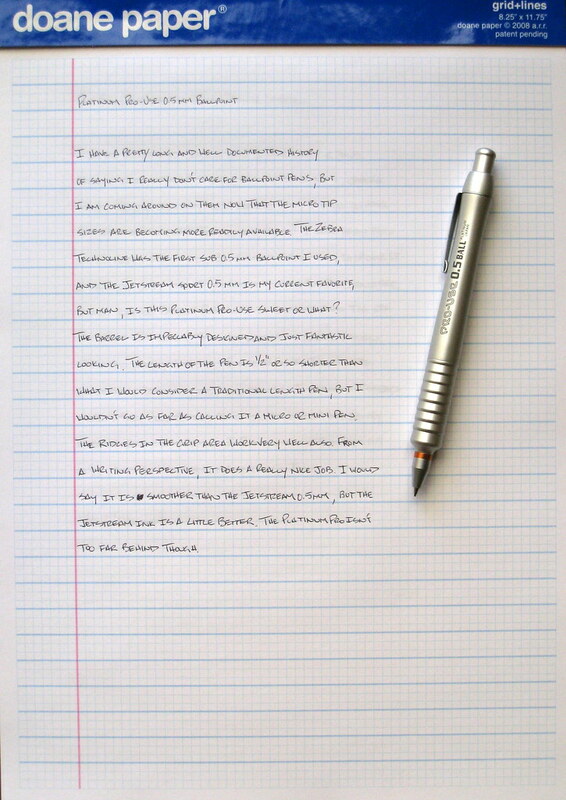 If I had never tried the Jetstream 0.5mm ballpoint and fallen in love with it also, I would have never even considered trying the much more expensive Platinum Pro-Use 0.5mm, but I have seen the top of the mountain, and it is good. From appearances alone, this pen is a real looker. The sleek, fully aluminum body looks like a finely crafted surgical instrument. It feels great in the hand, including the grip area, which was an original concern of mine. The grip is just fine and surprisingly comfortable. Now, I wouldn't expect the grip do a great job outdoors in a hot or humid environment, but in an office type setting there are no noticeable issues in gripping the pen. On top of the great styling, the 0.5mm tip size is what really sold me (this same pen comes in 0.7mm and 1.0mm versions as well). The line is as crisp and as clean as the previously mentioned Jetstream, with no ink mess and minimal streaking. I put the pen to the page and it just goes, and considering the tip size, it is not scratchy at all. I do wish the black ink was a touch darker though. The only possible issue I see with this pen is that the ink cartridge is very tiny (see exploded view below). I haven't put a dent in it yet, but with heavy use I am assuming it will empty out quickly. There is also the issue of cost. At $22.50 it is not cheap (refills are another $1.50/each), but I have been very pleased with the Platinum Pro-Use ballpoint so far, and see no real reason that will change. Posted on May 24, 2010 by Brad Dowdy.